When you’re starting a new hobby, you want to begin with all the right tools and equipment for your level. Usually, beginners like to stay away from “beginner-friendly” products because they think they might not match up with the stuff made for professionals. That’s why we’ve come up with five paddle boards for beginners that are great for getting started but will also get the nod of approval from experienced SUP riders. 10'6" x 33" x 6"
10'4" x 31" x 4"
10' x 33" x 10"
9'6" x 33" x 5"
10'6" x 30" x 5"
What Makes a Good Beginner Board? Choosing a paddle board comes down to the type of paddling you’re going to do, where you’re going to ride the board, and also how skilled a paddler you are. In our top 5 beginner SUPs are a few popular brands: iRocker, BIC Sport, and Isle. As a beginner, you're going to want a board that is easy to balance​ on, which generally means a wider board. Falling off every five minutes is not good for confidence when you're learning. You’re also going to find yourself in flat water conditions most of the time when starting out. It's important that you pick a board with the right dimensions and hull shape for these conditions. As a side note, you may want to select a board that allows you to try your hand at surfing when you get a little more experienced. Most boards will allow you to catch small waves, but mid-size waves are going to require a tougher board. The wider the board, the easier it is to balance. I would recommend that beginners go for a board that is at least 30 inches wide. If you’re clumsy like me, choosing a board that is 32” or wider is a good move. These boards are easy to stay upright on in flat water and mild waves. Narrow paddle boards are faster, but you should focus on balance over speed in the beginning. Once you’ve mastered the basics, then you can start thinking about performance. As you’d expect, the longer a board, the harder it is to control. For beginners, a short to medium length board between 9 and 11 feet is ideal. Children’s boards will be shorter still. 8 feet is a good benchmark for a child, but it depends on the height and strength of the child. Long boards around 12.6 feet and up are great for racing and touring as they slice through waves easily making them much faster. Yes, it sounds good, but don’t be tempted just yet. The volume of the board takes into consideration the length, width, and thickness of the board. It is recorded in litres. The higher the volume, the more weight the board can support. Touchy subject I know, but you have to be honest. It's important that you consider your own weight and the weight of any equipment you'll take with you on day trips. You may not sink if you exceed the maximum capacity of the board, but it will be harder to paddle and less stable. Increasing weight on the board will cause it to sink further resulting in increased drag and for the rider to feel more water movements. Don’t gloss over when the guy at the SUP shop starts talking about hulls. It simply refers to the shape of the SUP body. There are two types - planing and displacement - and each has different characteristics which affect performance. A planing hull is flat and wide, making it more stable and beginner friendly. The flat and rounded hull also makes these boards more suitable for a wider range of activities, including riding ocean waves. Dispacement hulls are more angular and also feature a narrow v-shaped bow (similar to a kayak) to optimise speed. They are slimmer and longer than boards with planing hulls, which of course means they are less stable. When looking up SUPs, you may have noticed talk of different materials. The core materials in the board will affect the ease of use, stability, manoeuvrability, and of course, weight. You don't often have to worry about materials as boards from reputable manufacturers will feature quality materials fit​ for purpose. Here's a quick overview of common SUP materials. This is the most common board design. The foam core is covered with epoxy and fibreglass, although the shell can be made from plastic or carbon fibre. These are heavier than EPS, which makes them more balanced. These are more popular with beginners. The outer shell is covered with the same protective coverings. Inflatable SUPs are made from a tough PVC exterior. Don’t be put off by the term “inflatable”, these boards are remarkably durable and have the added benefit of easy storage and transportation. Actually our most favorite beginner SUP is an inflatable standup paddleboard! Check out our top ﻿﻿recommended inflatable paddle boards. The SUP body can also be made of wood, although this is less common. Other factors you might want to consider when choosing your board are the number of fins, the board manufacturer, and the colour and design. The fin affects the stability of the board and impacts its ability to travel straight (tracking). You'll notice that some boards have three fins and others only have one. The boards with three fins are better suited for beginners as it increases stability and tracking, and the outer fins also allow ease of steering if you decide to try surfing. The colour and graphics are important but don’t pick a board purely based on the style. It’s a surefire way to end up with a board that’s completely unsuitable for your skill level and its intended use. If a board ticks off all of the criteria we've already covered and also features a sick design, then she's a keeper. By now, you should have a good idea of what you’re looking for, but you may still be a little lost when picking a board from the many options on the market. So, to save you a lot of hassle, here are our top five boards for beginners. 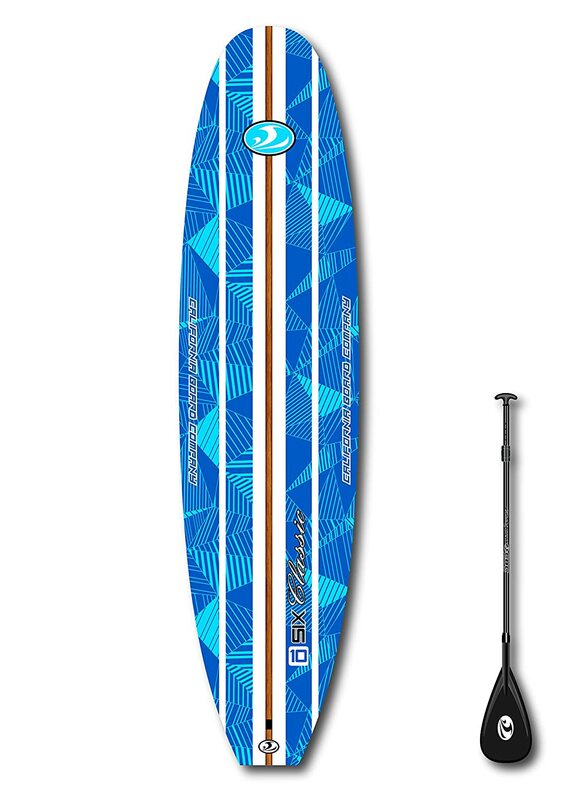 Finally, we have this beautiful board: the iRocker Cruiser is an inflatable SUP with a great design! The iRocker Cruiser is actually our most favorite beginner standup paddleboard! It’s one of the longest and widest beginner boards and therefore more stable than other iSUPs. It's user-friendly, durable, and comes with all the nice accessories. Stable – the 33-inch-wide board makes you feel comfortable on the water. You need a board that boosts your confidence and that’s what you get with this. Speedy – it's not a race board of course, but for the size and width, this board moves rather quickly. Accessories – the iRocker Cruiser comes with a dual action pump, backpack, fiberglass paddle, ankle leash and repair kit! Nothing really! – Ok, when I really have to find something then I'd say the fiberglass paddle. If you want to improve this setup, you could opt for a carbon SUP paddle which would reduce the weight and improve handling of the paddle. But for the rest, this is our most favorite beginner standup paddleboard! This medium length board is ideal for beginners with a bit of confidence, as its width and thickness balance are rounded up with its narrow, waving striping tip. The main selling point for me is the durability of the board, hence the name, "DURA-TEC". As a beginner, things will and should go a little crazy. I make it a practice to avoid beaches with a lot of rocks, but it’s comforting to know that if that should happen, this baby can handle it. Affordable – the price is right for this board. You don’t want the cost of repairing or replacing a board from enjoying it. Durable – the polyethylene body is tough, which is ideal for beginners. When you’re learning to SUP you will obviously have a few mishaps, so a durable body should be a consideration. Multipurpose – the design of this board makes it suitable for paddle boarding on calm currents but is also excellent for strong waves. Length and shape – the board comes in at the tail end of the medium range, making it harder to control. New beginners with surfing experience won’t be troubled by this, but if you’re worried you might not be very stable, then this might be a stretch. Heavy – this makes it harder to transport and also a little harder to control. Now this is an interesting looking and nifty designed board. It’s a medium-sized board with, get this – an internal storage space in the hull! Yes, I’d feel so cool cruising with my lunch pack in my paddle board. Who wouldn’t? If you get tired on the sea, just pop it open and grab a drink or a light snack….or two. It’s good for the family and comes with some other cool features, but it’s time to look at what really matters. Easy to use – the board is designed to be used by kids and adults alike. It has nice features like non-slip foot pads, and various handles to ease carrying. Adjustable paddle – the paddle can be changed to make it single or double bladed. So you can sit down and paddle like a kayak as well as stand-up paddle. Stable – the length makes it well balanced, which is what beginners need. The board is only 10 feet long and is 33 inches wide, so you’re less likely to fall-off. Heavy – this 50 pound board can be a chore to move about. The board is advertised as lightweight, but don’t be fooled. There are handles to ease carrying, but that doesn’t change the size. Limited use – as it is a family-friendly board, it’s not designed for exploration. Lakes and calm seas are the ideal locations for this board. Any attempt at going for big waves may leave you slightly disappointed. Appearance – I know this isn’t a real con as this is based on personal preference. But looking at the board might leave you a little confused as to what it is. It doesn’t have the expected SUP look, but I guess the pros make up for it. This retro looking board is a snazzy piece of equipment. 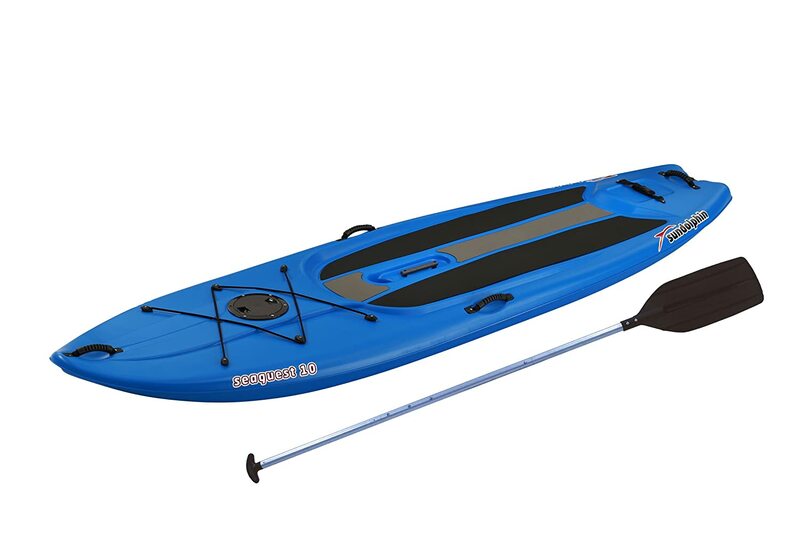 It’s made for the family and for easy-going SUPing. It’s a medium sized board, quite thick and comes with non-slip foot grips. I like the look, I like the feel, and I like the stability. The board is designed with beginners in mind, which is just yay! Stable – the board is designed for optimum balance. Its wide base on medium length make you feel in control. To make it even better, the grip is fantastic. Family-friendly – the cross-generational design makes it adequate for parents and kids alike. Lightweight – the thought of carrying a heavy board around can discourage you from hitting the waves. That is not the case with this board and this should be commended. Limited use – this board can only be used on flatwater or very mild waves. You can’t take this out anywhere risky, so even when you become more courageous as a SUP boarder, you won’t be able to test it. Fragile – this is not a very durable board. It is good for lakes, but not for the open seas. The shell does get bruised or dented a fair bit because of its foam core. This light board is full of surprises. 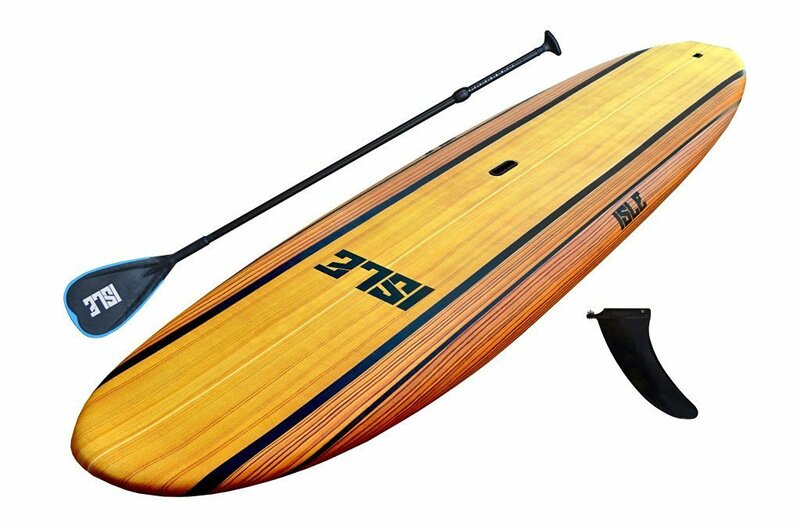 It is a medium sized board that comes with an adjustable paddle, to suit surfers of almost any height. It’s a great looking board and the accessories make it that much more enjoyable. Stable – the board can take a surfer weighing up to 300 pounds, which is just WOW! The dimensions make it suitable for new surfers. Light – paddle board surfing is a lot more enjoyable when you don’t have to worry about your arm getting tired before you reach the water. Affordable – need I say more? Slow – it’s a big board, so something’s got to give. Lacks agility – the board doesn’t quite glide in the water as you would expect, so manoeuvring might be a challenge as your ability increases. So there you have it, five boards to choose from. I am hesitant to pick one board, but if I had to make a decision, I would say the iRocker Cruiser is the best beginner paddle board. Just because you’re a beginner doesn’t mean you will always be one and you don’t want to outgrow your board too quickly. The Odysseus strikes a good balance between beginner and more advanced boards. The iRocker Cruiser rides very well, is affordable, comfortable, and will stand the test of time. It is lighter and hence more convenient to transport than the other boards. It is also tougher than the other boards on the list. This board can also hold its own on the waves and is not limited to duck-ponds, making it a good choice if you have surfer aspirations. Though it's not the cheapest beginner iSUP, it is certainly worth it, because you know it will serve you well for a very long time. After all, what’s the point of buying a board if you’re going to replace it in a few months?